Published: Dec. 10, 2017 at 04:59 p.m. Published: Nov. 23, 2017 at 06:19 p.m. 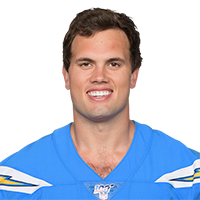 Published: Oct. 8, 2017 at 03:41 p.m.
Los Angeles Chargers quarterback Philip Rivers hits tight end Hunter Henry for a 25-yard touchdown. Published: Oct. 2, 2017 at 07:03 p.m.
Los Angeles Chargers tight end Hunter Henry makes an incredible 4-yard TD catch.